Been over £1 since November. Still £1.10 in the other main supermarkets. Something tells me there are going to be an awful lot more "beef" related "bargain" deals ahead. this produced is by the same company that supplies findus. (IS THIS REAL BEEF)suet!!! Oh I could eat a horse. Is this a type of glue? this produced is by the same company that supplies findus. (IS THIS REAL … this produced is by the same company that supplies findus. (IS THIS REAL BEEF)suet!!! I know this is digging out a old deal, but i couldnt help but do a little research upon reading your comment. Firstly why did you sign up to a forum with the name 'isitbeef' as your username, while posting purely on this thread? seems odd. 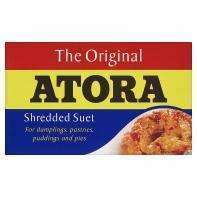 Secondly, i cant find anywhere that states findus own atora. again no mention of findus on either pages.